Secret of the Wings "Sisters"
The Pirate Fairy - "Experimenting"
Pick one: Silvermist, Fawn, Rosseta ou My personal fave: TINK! le choix des fans: TINK! Which version of Tinker cloche, cloche, bell is your favorite? is tink your fav fairy?? le choix des fans: of course!!! Which fairy is your Favorite? What do toi like most about Tinkerbell? why snow fairy cant traverser, croix the border, while in the 1st movie they came to pixie dust tree? Here is what toi most likely don't know about La Fée Clochette movie #1. Only a true fan such as myself will know this: Tinker cloche, bell is born from the first laugh of a baby, and is brought par the winds to Pixie Hollow (which is part of the island of Never Land). She learns that her talent is to be one of the tinkers, the fées who make and fix things. Two other tinker fairies, Bobble and Clank, teach her their craft, and tell her about the fées who visit the mainland to bring each season. Tink is thrilled and can't wait to go to the mainland for spring. toi may have heard of the new La Fée Clochette movie coming out, but did toi know that Disney is planing to make four La Fée Clochette movies? The first one will come out on DVD October 28th, 2008. Summary: A new fairy, La Fée Clochette arrives, and finds out her talent is pots-and-pans, but thinks her talent isn't specail. an answer was added to this question: Who do you like better,the Tinker Bell in the Peter Pan movies,or the Tinker Bell in the Tinker Bell movies? an answer was added to this question: Shouldn't "Tinkerbell" be "Tinker Bell"? I thought it was two words, or at least this (http://www.imdb.com/title/tt0823671) would make it appear that way... Is it possible to edit the title of the spot, so that it's correct? a comment was made to the poll: Pick one: Silvermist, Fawn, Rosseta ou My personal fave: TINK! a comment was made to the poll: is tink your fav fairy?? a poll a été ajouté: Which version of Tinker cloche, cloche, bell is your favorite? 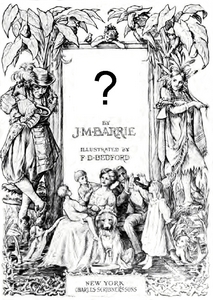 What is the name of J. M. Barrie's original novelization of the story of Peter Pan (the story in which Tinker cloche, cloche, bell first appeared)? I AM TINKER'S BIGGEST FAN!!!!!!!!!!!! SOME FUN FACTS ABOUT TINKERBELL!!!!! I AM NO DOUBT AM TINK'S BIGGEST EVER FAN!!! par FAR!! !